Hysteria seems like a term that applies to people who are being a little overly emotional, so it may surprise you to learn that it was once a common medical diagnosis. In layman's terms, hysteria is often used to describe behavior that seems excessive and out of control. When someone responds in a way that seems disproportionately emotional for the situation, they are often described as hysterical. During the Victorian era, the term was often used to refer to a host of symptoms that were generally observed only in women. So what did hysteria look like? Symptoms of the illness included partial paralysis, hallucinations, and nervousness. The term is thought to originate from ancient Greek physician Hippocrates, who associated these symptoms with the movement of a woman's uterus throughout different locations in the body. Ancient thinkers believed that a woman's uterus could travel freely through different areas of the body, often resulting in different symptoms and ailments based upon its travels. The term hysteria itself stems from the Greek hystera, which means uterus. Hysteria may not be a valid psychiatric diagnosis today, but it is a good example of how concepts can emerge, change, and be replaced as we gain a greater understanding of how human being think and behave. During the late 1800s, hysteria came to be viewed as a psychological disorder. 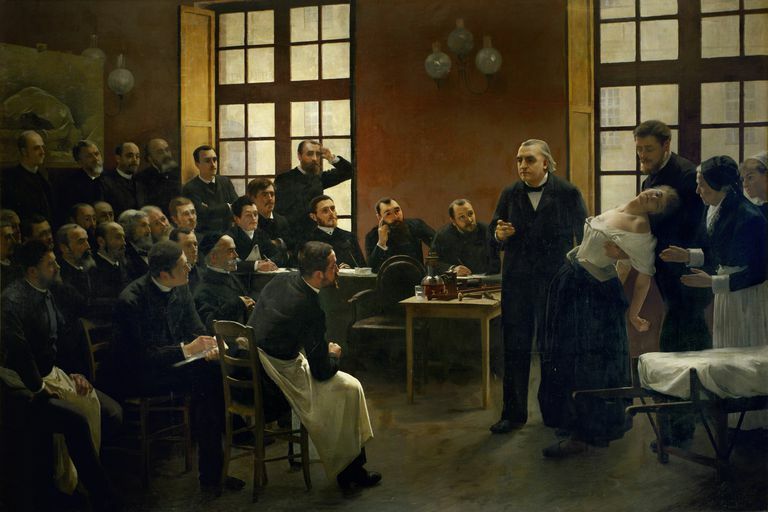 French neurologist Jean-Martin Charcot utilized hypnosis to treat women suffering from hysteria. The mystery of hysteria played a major role in the early development of psychoanalysis. The famed Austrian psychoanalyst Sigmund Freud had studied with Charcot, so he had first hand experience observing patients who had been diagnosed with the ailment as well as Charcot's treatment methods. It was Freud's work with colleague Josef Breuer on the case of Anna O., a young woman experiencing the symptoms of hysteria, helped lead to the development of psychoanalytic therapy. Anna had found that simply talking about her problems with her therapist had a major impact on her well-being. She dubbed this treatment the "talking cure" and it is now still referred to as talk therapy. One of Carl Jung's patients, a young woman named Sabina Spielrein, was also thought to suffer from the disorder. Jung and Freud often discussed Spielrein's case, which had an impact on the theories both men developed. Spielrein herself trained as a psychoanalyst and helped introduce the psychoanalytic approach in Russia before she was murdered by Nazi's during World War II. Today, psychology recognizes different types of disorders that were historically known as hysteria including dissociative disorders and somatoform disorders. Dissociative disorders are psychological disorders that involve a dissociation or interruption in aspects of consciousness including identity and memory. These types of disorders include dissociative fugue, dissociative identity disorder, and dissociative amnesia. Somatoform disorder is a class of psychological disorder that involves physical symptoms that do not have a physical cause. These symptoms usually mimic real diseases or injuries. Such disorders include conversion disorder, body dysmorphic disorder, and somatization disorder. In 1980, the American Psychological Association changed their diagnosis of "hysterical neurosis, conversion type" to that of "conversion disorder." In the recent publication of the DSM-5, symptoms that were once labeled under the broad umbrella of hysteria would fit under what is now referred to as somatic symptom disorder. American Psychiatric Association. Diagnostic and statistical manual of mental disorders (5th ed.). Washington, DC: Author; 2013. Micklem, N. The Nature of Hysteria. Routledge. ISBN 0-415-12186-8; 1996.